Jane Austen: What’s in a Name? I have long been fascinated by Jane Austen’s choice of first names for her characters, and today I’m looking at how the early 19th naming system worked. The 1800 name pool was, by modern standards, surprisingly small, and this is echoed in Jane Austen’s constant reuse of the same names. Take the name Mary; there are two Marys in Pride & Prejudice (Mary Bennet and the heiress Mary King, pursued by Wickham); a Mary Crawford in Mansfield Park; and Mary Musgrove in Persuasion. According to research done by The Names Society, Mary was the most common girl’s name in 1800, closely followed by Anne and Elizabeth, so perhaps we should not be surprised. 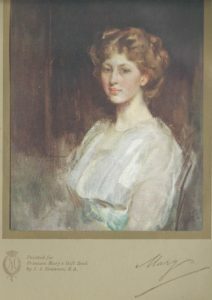 Jane Austen even calls two major characters by her own Christian name, Jane, which comes in at number 5 in the 1800 list. There is Jane Bennet in Pride & Prejudice and Jane Fairfax in Emma. 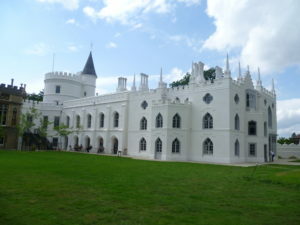 Recently, I saw the Lost Treasures of Strawberry Hill exhibition at that extraordinary Gothic extravaganza, Strawberry Hill, the summer villa of the author, letter writer, and passionate collector of the Fine Arts, Horace Walpole (1717-1797). 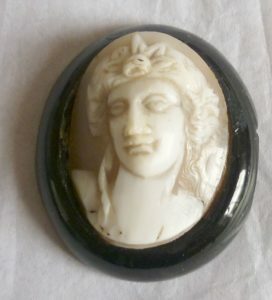 Horace was the son of the politician and statesman, Sir Robert Walpole, and rich enough to do what he wanted: travel in Italy, buy art and antiques, and live the life of a cultivated man of leisure. 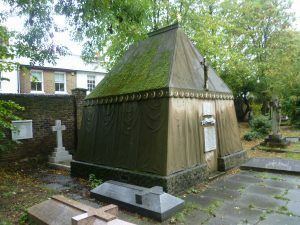 His tastes were unusual and original – and he had the money to indulge himself. John Ruskin (1819-1900), an art critic and a man who held strong views on what values a society should hold, was one of the most influential men of his generation. For example, when Lucy Honeychurch, heroine of E. M. Forster’s A Room with a View (1908) visits the church of Santa Croce in Florence, she’s desperate to know which tombstone was praised by Ruskin. This is her first trip abroad and she’s unsure of her own taste; she needs the reassurance that she’s admiring the right one. 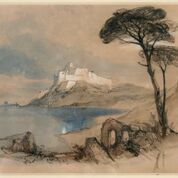 However, I think it’s fair to say that Ruskin is not always an easy person to appreciate in the 21st century. Nowadays, we like to view ourselves as liberal-minded and tolerant, particularly in sexual matters. An intellectually very gifted only child, Ruskin was brought up on strict Puritanical principles and cossetted by both parents. His mother had high moral standards and was a very controlling parent. It is not surprising that Ruskin turned out to be obsessive, sexually inhibited and highly-strung. I have been re-reading Jenny Uglow’s In These Times: Living in Britain Through Napoleon’s Wars, 1793-1815 in which she demonstrates very clearly how the Napoleonic Wars permeated every aspect of life for twenty-two long years and affected everybody – including Jane Austen’s characters – as the country faced the urgent need for men for the armed forces, military supplies, ships, a modern transport system, efficient banking, and so on. This post is a refutation of those critics who assert that Jane Austen’s novels concentrate only on domestic everyday life as lived by the English upper-middle classes.Jane Austen, they say, ignores the wider picture and fails to mention the Napoleonic Wars. This, in my opinion, is simply not true. In fact, the war is a constant, and important, background to her novels; the problem is that most modern readers fail to recognize her references to it. 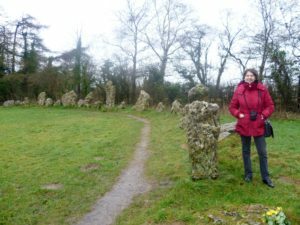 Visiting the Rollright Stones in Oxfordshire in January with my daughter was a slightly spooky experience. Set in a field next to an ancient ridgeway with a wood nearby, these prehistoric stones still exude an air of power. The most important are ‘The King’s Men’, a Neolithic stone circle of over a hundred stones weather-worn into fantastical shapes (the exact number is unknown – legend has it that they are uncountable), dating from around 3000 BC. 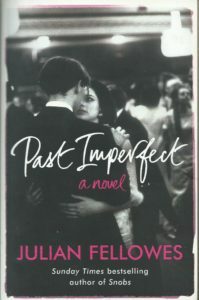 Last year, a friend gave me Past Imperfect by Julian Fellowes for my birthday. I knew who he was, of course, but although I had seen and enjoyed The Young Victoria, I hadn’t watched Gosford Park because I feared I’d find gaffes which would either infuriate me or make me cringe. Past Imperfect was, therefore, something of a revelation for its wit, acute social observation and terrific storytelling. As I read, I realized, with a sense of shock, that I knew exactly where Julian Fellowes was coming from because the story’s social background, as told by his anonymous narrator, was, in many respects, painfully similar to my own. He didn’t pull his punches and his depiction of the late 1960s amongst what rather too many reviewers patronizingly called the ‘toffs’ was spot on. Princess Mary, the Princess Royal (1897-1965) was seventeen when World War I broke out in 1914. In normal circumstances, Mary would have been kept under wraps until she was eighteen and come out in Society, but, the outbreak of war changed everything. 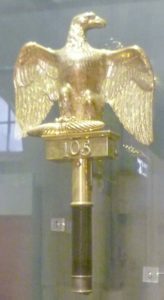 The House of Saxe-Coburg began to be accused of being far too German, and King George V and Queen Mary found themselves with an image problem. On December 16th, 1775, in the rectory at Steventon, Hampshire, on a freezing winter’s day, the rector’s wife, gave birth to a daughter. The baby was, of course, Jane Austen, and she was to become one of our greatest novelists. Her books have given us so much pleasure, as well as inspiring numerous film and television adaptations. 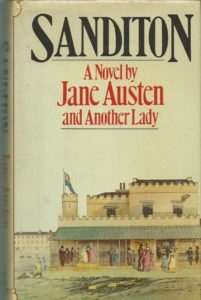 Then there are those books her works have influenced from Marghanita Laski’s completion of Sanditon in 1975, 200 years after Jane’s death; Amanda Grange’s clever Mr Darcy’s Diary; to Val McDermid’s witty and perceptive modern take on Northanger Abbey, to name but a few. Many Jane Austen characters have also had interesting afterlives as detectives, vampires or zombies; and some of them have even met up with Austen characters from her other books. So today, on her birthday, it’s only fitting to pay tribute to many people’s favourite author, including mine. We’ve just past November 30th, St Andrew’s Day, the patron saint of Scotland, so it feels appropriate to celebrate the 19th century transformation of that beautiful country. 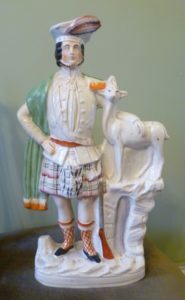 My parents lived in Invernesshire, in the Scottish Highlands, for many years and their house contained a number of things unmistakably inspired by Scotland, one of which was this large flat back Staffordshire figure of a kilted Highlander with his arm around what looks like a small deer. I’ve always liked it – partly because it looks so absurd. There is a gun dangerously positioned beside the highlander’s left leg pointing upwards, (my brothers and I had to learn the ‘Never, never let your gun/ Pointed be at anyone’ rule before my father, an excellent shot, would allow us anywhere near a gun), and the figure has a horn at his waist. Why? To summon a gillie? Or does it contain gunpowder for the gun, though that seems unlikely.